Description: Webb and Bower 1980, first G. B. edition : mottled red leatherette hard cover with gilt edge decoration, and central tribal horsman to front cover: gilt lettering to spine : dust jacket:approx 7.5 x 10 inches tall: 217 pages plus index: high quality illustrations throughout. Synopsis: A volume of personal family memoirs presented by M M Kaye concerning the reminiscences of his Great -Grandmother , Emily Annie Theophila Metcalfe, eldest daughter of Sir Thomas Metcalfe, born at Meerut in the North West Provinces of India in 1830 . These reminiscences - edited, and enlarged with the background history of India during the quarter of the century preceding the Sepoy Mutiny of 1857 - provide a detailed and fascinating account of a young woman growing to maturity amid the flamboyant finery of the diminishing Mogul Empire. Included are 110 facsimile pages of the “Dehlie Book” compiled by Emily’s father Sir Thomas Metcalfe, a collection of detailed descriptions of the places and personages of the “Imperial Delhie.” In which he lived and illustrated by commissioned artists of the time.Condition: A edges o dust jacket slightly:overall very clean , good and collectable . Mary Ward Books is an independent online bookstore specialising in second hand, out of print books and used books such as Golden Calm: English Ladys Life in Moghul Delhi by Kaye, M M. We offer a book search facility and secure payments via PayPal and Nochex. Mary Ward Books is based in East Anglia, United Kingdom. We were established in 1997 and have been selling books online since 2002. 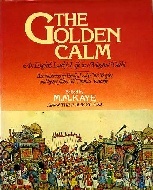 We ship worldwide, please click here to see our shipping charges for Golden Calm: English Ladys Life in Moghul Delhi by Kaye, M M.